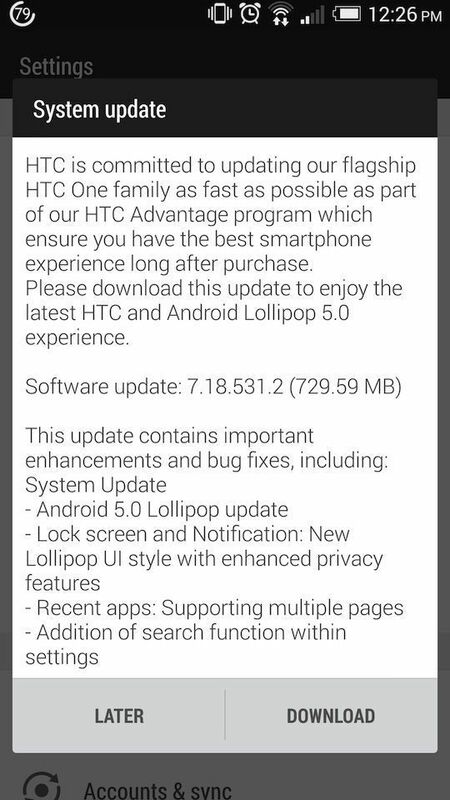 At the end of last week, one of HTC’s product chiefs tweeted out that we can expect the Android 5.0 Lollipop to arrive for the original HTC One on T-Mobile to land on Tuesday, March 10th (tomorrow). But, if an email from our readers is anything to go by, T-Mobile and Google pushed the button early. Unlike many Samsung phones, the update measures in at less than 800MB. But with it still being the early stages of the rollout, it may take a little while to show up on your device. If you have the phone, and you haven’t yet received the notification to install it, go in to your settings menu and check for the update manually. Hopefully it’s there waiting for you. Weighing in at 730MB, the update includes Android 5.0, some new Lollipop-style lock screen and notification UI plus some some “important enhancements and bug fixes”. As always, let us know how you get on with the update. Was it a trouble-free install, and has it given your old One a new lease of life? 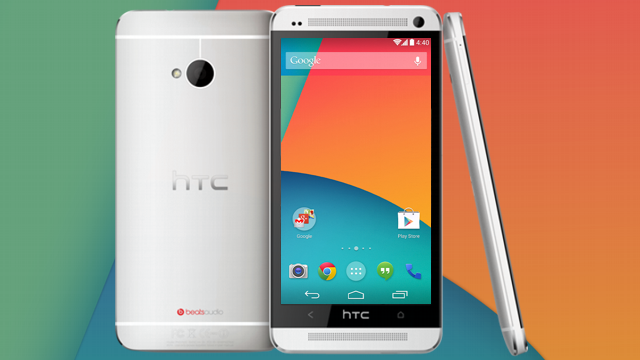 I don’t want to ruin a great moment for HTC owners, but when is lollipop coming to the S4. If there is one thing I HATE about Android, it’s that Google lets carriers control updates. And don’t let me get started on bloatware (but that’s another story). Thats part of the reason I crossed over to the world of iPhone. My only regret? Not doing it sooner. Removing battery for hard reset… Am I just really lucky but I still am using an s2 ruining cm 10.2 (android 4.3.1) and don’t remember the last time I removed the battery for a hard reset. I downloaded the update and now my phone is bricked!!!! After it passes the boot screen I get “demo stub has stopped unexpectedly”, “UDOVE has stopped working” and “System UI has stopped working”. It flashes over and over and over asking me to send reports but never boots up! Google searches bring up nothing…probably because the update just came out. SO PISSED! Im experiencing the same issue. I just did a hard reset to see if that helps. please tell me how exactly you did that hard reset from the phone menu?, because I have the same problem with the annoying notification every few seconds. Thanks. Its really annoying. But you have a solution. In the settings goto Accessibility options. You have the Systems option over there, disable the System Notification. And than you can leave in peace. Let me know if that works. Thank you Mithun, it works! :) Thank you a million times! All the best! This scares me a bit. Ran the update last night with no issues. Not much to see with Sense 6 covering most of the OS. New Pull Down Notifications/Quick Toggle look & a bunch of annoying notification cards all over the home screen. I have the same issue . what should I do ? Let’s get real! Battery pulls seem to be a fading thing BUT they still CAN AND DO occur! Nothing to do with using your phone properly. I did the same when the iPhone 6 was released and definitely regret not doing it sooner. I’ve been an Android user since day 1 (had the T-Mobile G1 on preorder), but I’ve grown sick of carrier control, bloatware and constant update delays. I also got tired of the rooting scene. Having used the iPhone 6 for the past 6 months, I doubt I’ll be coming back to Android any time soon. How much does Apple pay shills like you? Not as much as Google pays trolls like you, apparently. Meanwhile your here in the comments section of an ANDROID article…. Priceless!!! Thanks for the laugh. Thanks for the laugh on commenting on a post from 17 days ago. Priceless. This is a T-Mobile blog. Not only ANDROID. Well, im glad to see im not alone. Have any of you given Windows Phone a try. That’s my current platform and it’s very similar to the iPhone. No fragmentation, and no bloatware. Anything can be uninstalled if there is a pre-loaded app you don’t want. Samsung is already rolling out lollipop for the galaxy s4 in various parts of the world. It will get to T-Mobile soon. Just a heads up, there are no virtual nav buttons on the HTC One M7, and the one in the screenshot is running stock KitKat instead of Lollipop. You may want to slap a screenshot of Sense on it for better accuracy. Ruined my nexus 7 tablet. There is no way this shi t is touching my phone. Htcm8 se owner. Running it now with no issues. I’ll stick it in my ideas pile..
Con: you have to stop whining about not have the latest update. Haha. But I like moaning about things.. it makes me happy. So glad for the update! Been sitting in T-Mobile labs since the super bowl. It’s running great so far, kinda mad they didn’t add the quick widgets from stock android in the notification shade like flashlight and guest mode and cast screen. Runs great tho, anyone who has problems probably should do a factory reset and then update. You could always use the quick tools widget and out it on your home screen. wtf, where is the Note 4 update ya jackwads? Just noticed this yesterday on the T-Mo Software Update page, T-Mo’s Note 3 already has the update — I’d be pissed if I was a Note 4 user. My phone is messed up after trying to install this update :( It just keeps restarting over and over again, and never booting up. Argh! Now what? That doesn’t work :( T-mobile tech support can’t figure it out either. I’m on the phone with HTC One right now. Hope this fixes battery drain. All done here, and after a factory reset, it did another Android update….the latter version to L I suppose. Surprised to seeing it already rolling at. Currently on my Lumia 1020, but I guess I’ll be switching back over to my HTC One M7 this evening until Microsoft provides a W10 for phones preview for the 1020. Interesting, I have a dead volume key as well…..and I actually think it’s software related, not hardware. It started right free the last kitkat update (at&t) , volume up stopped working, then later volume down stopped worked, but now it works intermittently, and the times it does work, I see a very quick icon flash up on the left side of the taskbar. Took like 1.5 hours to upgrade on mine. Not much difference, other than the notifications. Anyone having issues with Wi-Fi calling cutting out every 5 seconds since the upgrade? OTA Rolled out a day earlier on March 9th and took about 40 minutes to update. There is no significant changes aside the notification on lock screen. Missing the “profile” setting for None Priority All in notification pull down. HTC was not able to silent notifications for certain text messages and no flashlight was preinstalled? This why,I never updated my phones,too many problems, using the Note 3,will not updated it. I keep reading on here,all different kinds of issues people have with updates. I am so pissed off for installing this update. The ease of listening and controlling music on my locked screen was a huge bonus i enjoyed and now it’s been taken away. I just hate the whole thing. Split camera? what purpose does it serve? None. Don’t give us useless features to make it seem like their being innovative and pushing boundaries. I updated my HTC One M7 seamlessly. It took about 20 minutes to install and reboot. A few things were changed on the graphics as expected, but it was interesting that by default the NFC is turned on (which I have never used and want to keep it that way for now), now the WiFi is stuck in the ON position. There is not way to turn it off. However, the worst problem now is the phone “loosing” the SIM card and asking me to enter my SIM PIN every 4 hours or so to read it. I just updated my phone this morning took about An hour enduring was fine til it rebooted and now it’s stuck on the restart HTC screen and keeps reporting my system UI has stopped. I did the system manager and still has the same problem. It has to be the day I’m on “on call” for work. Really disappointed a HTC one users.!!!!!! update is cool. I can’t see some emojis so that is frustrating, they show up as a box with an x in them. Overall my battery life has improved don’t have to keep charging every hour. Need emoji problem fixed fast!